We are a celebrated manufacturer, supplier and exporter of the solar panel believe in rendering one stop solution concerning solar energy and thereby make notable efforts in the direction. Our introduced solar mounting structure is one of them, made inputting highest quality galvanized aluminum material and employing top of the line technology to deliver the highest sturdiness, corrosion resistance and stand ability against any inclined weather conditions. 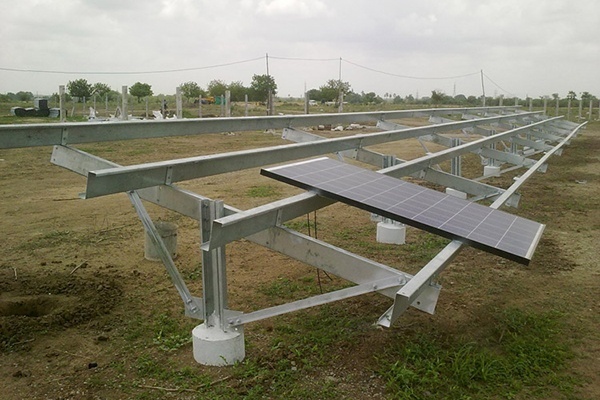 We are instrumental in this field of the manufacturing solar mounting structure which has enabled us to design and manufacture any size and type of solar mounting structure as per requirement. Further, our rich facilities at our headquarters gives us a strength to manufacture any size of the solar mounting structure for various applications incorporating solar Flat roof mounting, Ballast solar mounting, Tile roof mounting, Metal roof mounting, Ground mounting and Module mounting. We as a manufacturer of the solar mounting structure are well versed to provide customized mounting structures to fit into the available space at the best possible rates in the market. The provided customized range of the mounting structure is of highest quality standards featuring excellent corrosion resistance, excellent temperature resistance and long shelf life and as this range of the solar mounting structure is constructed from the galvanized aluminum, it does not demand any maintenance.